It has been one year since President Donald Trump took office. As Americans reflect on Trump’s turbulent tenure, his record on national security and foreign policy has been alarming. Under Trump, America has retreated from its global and moral leadership roles, alienated its democratic allies, and abandoned the bipartisan defense of liberal ideals that led to more than 70 years of security and prosperity. America is more isolated, less respected, weaker at home, and ultimately less safe under President Trump’s leadership. Whether it is Trump’s immoral, unwise, and botched travel ban on Muslim-majority nations; his reckless Twitter warmongering on North Korea; or his self-isolating moves to upend the Iran nuclear deal and risk another military confrontation in the Middle East, the result has been the same: America is appreciably less secure than it was a year ago. And the Trump administration’s daily campaign against the nation’s diplomats, intelligence community, law enforcement, and civil servants is gutting the very national security apparatus that the president will need to confront threats to America. Unfortunately, the damage that President Trump has done to the United States’ reputation and interests around the world will also have long-term consequences for Americans. Fewer nations will want to work with us, fewer will trust our word, and still fewer will want to fight alongside us if and when the time comes. Nations will look elsewhere for leadership, including to China, further jeopardizing the international rules that America and its democratic partners have defined since World War II to favor freedom and prosperity. Forget Paris: Trump announced U.S. intention to withdraw from the Paris climate agreement, damaging the world’s efforts to prevent climate catastrophe—a move that, in one fell swoop, did immeasurable harm to the planet, to America’s hard-won global leadership, and to U.S. economic competitiveness. Gifting China the world’s energy future: The nearly 200 nations signed onto the Paris climate agreement plan to invest more than $13 trillion in clean energy over the next decade. While Trump clings to the fuels of the past, Beijing is seizing the world’s energy future. The rules of global economic competition—made in China: On trade, Trump is letting China define the economic future in ways that will affect the United States for decades to come. The best strategy to push back on China’s economic bullying would be to partner with other nations to enforce fair rules of the road. Many other nations share U.S. concerns about China’s nonmarket economic policies and this broad community of like-minded nations is one of the strongest weapons in our arsenal. Instead of leveraging that, Trump is threatening China with unilateral whack-a-mole trade measures that may violate global trade rules—immediately alienating potential allies—and only address narrow symptoms of Chinese wrongdoing, while ignoring the underlying disease. China wants to keep nations who complain about its policies divided, and Trump is playing right into Beijing’s hands. That’s one reason Beijing sees the Trump administration as a strategic opportunity to advance its own interests at America’s expense. As the North Korean threat grows, Trump is weakening America’s ability to address it—and endangering the lives of millions. Making it worse, one tweet at a time: North Korea’s nuclear and missiles programs constitute one of the most serious national security threats to the United States, and yet Trump has only exacerbated that threat. When his secretary of state sought to forge a peaceful path forward, Trump took to Twitter to taunt his top diplomat and undercut the prospects for peaceful resolution. Reckless threats, damaging U.S. credibility, and risking war: Trump’s reckless rhetoric—even repeatedly threatening nuclear war—has damaged American credibility to deal with the danger posed by North Korea and raised the chances of miscalculation that could lead to an unnecessary conflict. Weakening alliances: Trump’s antics are damaging U.S. alliances, including with South Korea, providing a key opportunity for North Korea and China to weaken the U.S.-Republic of Korea alliance. In the face of a blatant attack on American democracy during the 2016 presidential election, President Trump and Secretary of State Rex Tillerson have largely pursued a policy of appeasement. Pulling punches: At every turn, Trump and his team have slow-walked, pushed back against, and undercut efforts to counter Russian aggression. They sought to block and then water down sanctions on Russia and to remove sanctions related to Russia’s assault on Ukraine. No plan to defend democracy: They have failed to formulate a serious response to ongoing assaults on U.S. democracy and those of our allies. On the contrary, by downplaying support for democracy and human rights and undermining efforts such as the Global Engagement Center, Trump and his team have hobbled efforts to counter Russian propaganda, especially in Eastern Europe. Inviting future attacks: This weakness in the face of Russian aggression only invites future attacks on America. Former FBI Director James Comey testified in March 2017 that Russia is not done: “They’ll be back. And they’ll be in 2020, they may be back in 201… [T]hey were successful.” And yet the Trump administration, by U.S. Attorney General Jeff Sessions’ own admission, is “probably not” doing enough. With his across-the-board military escalations, blank check to impulsive U.S. partners, hostility to the Iran deal, and disinterest in peacemaking, President Trump is making the Middle East less stable and increasing the risks of conflict. A silent surge, stealthily ratcheting up America’s wars: Trump sent thousands more U.S. troops and relaxed the rules of engagement for attacking potential targets in a silent surge of military operations from Afghanistan to Syria and Somalia, risking a slippery slope to getting America caught in another endless war with no end in sight. A blank check for Saudi Arabia: Trump’s blank check and unconditional military support to countries such as Saudi Arabia escalated conflicts and inflamed the terrorist threat posed to the United States. A bad broker for the “ultimate deal”: Trump’s decision to move the U.S. embassy to Jerusalem—without any effort to link the move to larger plans for Mideast peace—isolated America internationally and was condemned by close allies. To date, Trump’s efforts to at peacemaking have only moved the parties further apart. Meanwhile, Trump’s careless revelation of intelligence secrets to Russia and lack of a plan to deal with Iran has Israelis increasingly worried. Trump has undermined the most effective aspect of America’s Iran policy—the nuclear deal that blocked Iran’s path to nuclear weapons. On Iran’s destabilizing behavior in the Middle East, Trump has offered only demonizing bluster, without any serious plan to push back. The result has been an emboldened Iran and an isolated America. Devaluing U.S. commitments by threatening the Iran nuclear deal: Trump has threatened to kill the deal that unified the world against Iran’s nuclear program and blocked Iran’s pathways to nuclear weapons. His saber-rattling has isolated America and its allies while convincing the world that if the nuclear deal ultimately fails, it will be Trump’s fault. By threatening to break America’s commitment, Trump is making North Korea and other problems harder to solve by undercutting the value of a deal with Washington. All talk, no strategy on Iran’s regional meddling: Trump’s heated rhetoric on Iran’s destabilizing actions in the Middle East was unmatched by any clear policies to push them back. The United States’ allies and adversaries see the gap between Trump’s talk and inaction, and this makes America weaker. Naked hypocrisy in championing human rights in Iran—and nowhere else: The Iranian people also understand the gap between Trump’s professed support for their cause and the hostility toward Iranians expressed in his so-called Muslim ban. President Trump has flagrantly and repeatedly undermined long-standing, bipartisan norms that protect the U.S. military from partisan politics. And in addition, he has hurt individual troops in the process. Crossing the line in front of America’s soldiers: Standing at a CIA memorial honoring fallen CIA officers, Trump bragged that “we were unbelievably successful with getting the votes of the military,” embarking on what has become the relentless pattern of treating U.S. troops as political props. No previous president has so irresponsibly and repeatedly politicized the military, telling troops to lobby senators on health care policy, trashing the media to them, and even promoting his U.S. Supreme Court nominee. This isn’t normal, and it weakens the military’s trusted place outside politics. Militarizing America’s foreign policy: Trump has contributed to the militarization of U.S. foreign policy and the erosion of civilian control, crowing like an autocrat about “my generals”—retired military officials and those in civilian positions—trampling on another set of long-standing norms that have benefitted the U.S. military and political system alike since its founding. Cruelly banning LGBT service members: President Trump’s sloppy, impulsive tweet banning military service by transgender troops needlessly stigmatized a community of patriotic Americans whose service poses no risk to U.S. national security. If enforced, it would deprive the military of skilled and talented troops. As a candidate, Trump promised to “do everything in my power to protect” LGBT citizens. Instead he showed senseless cruelty. No wonder military leaders and the courts have pushed back. President Trump’s repeated degradation of fundamental American values is undermining America’s moral leadership and hurting U.S. standing with people and governments worldwide. Offending and alienating people everywhere: Trump’s offensive, bigoted comments reportedly questioning whether America should accept Haitians or other immigrants from “shithole countries,” Trump earned the condemnation of the United Nations, African Union leaders, the Vatican, and people everywhere. “Both sides”: President Trump’s equivocal reaction to white nationalist bloodshed in Charlottesville, Virginia, demonstrated his indifference toward core American principles—from civil rights and equality under the law to freedom of assembly—and the world took notice. America’s approval ratings are tanking: In the six months after Trump took office, global confidence in the U.S. president sunk from 64 percent to 22 percent. Trump has praised some of the world’s most brutal autocrats—and they’ve figured out how to flatter and take advantage of him. Never a bad word about Putin: Trump has suspiciously failed to condemn Russian President Vladimir Putin despite Russia’s information warfare inside America, hacking of U.S. state electoral systems, massive disinformation campaign, and international atrocities such as bombing hospitals in Syria. Endorses Filipino extrajudicial killings: Trump praised his “great relationship” with Philippine President Rodrigo Duterte and reportedly vouched for the strongman’s approach to fighting drugs—despite reports of thousands of extrajudicial killings and Duterte’s own admission that he has personally thrown detainees out of helicopters. Flattery will get you everywhere: After leaders in Saudi Arabia, China, and elsewhere rolled out a gaudy red carpet for his visit and complimented him, he lavished them with praise and soft-pedaled the tough issues. 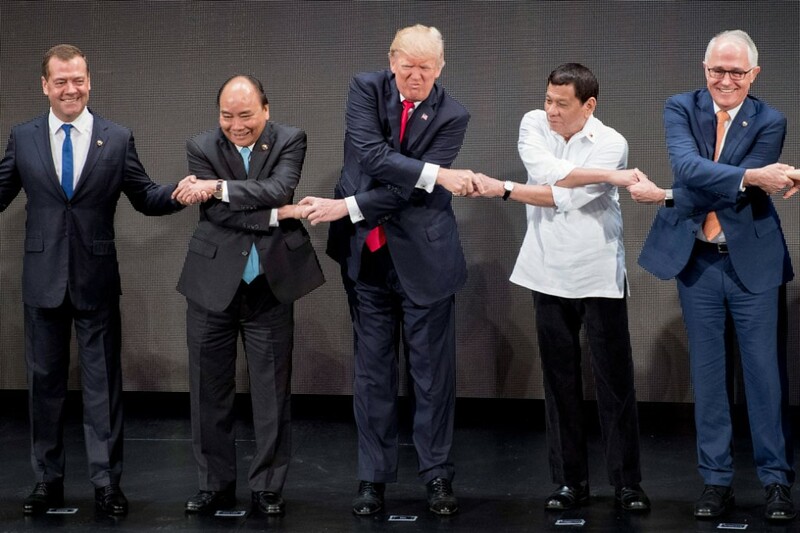 When it comes to the world’s autocrats, Trump seems to prefer friendly photo ops to driving a hard bargain on behalf of Americans. Downgrading diplomacy: The secretary of state is deconstructing and downsizing the State Department. Secretary Tillerson has pursued a “reorganization” that has delivered little and lost the trust of U.S. diplomats, while pledging to cut the department’s budget by nearly a third even before his initial review of the department’s missions was complete. Diplomats racing for the exits: Senior career officers have been forced out, numerous senior jobs remain vacant, the incoming class of new officers has been cut back, and the department’s influence on foreign policy in Washington is the lowest in modern memory. Simply put, American diplomacy is weaker under Trump and Tillerson, and it will take many years to recover after they are gone. From undermining the Iran deal to encouraging an East Asian arms race to threatening nuclear war, President Trump is on track to be the least effective, most blustering, least informed, and most dangerous U.S. president on issues of nuclear nonproliferation since the nuclear age began. Failed to accept reality that the Iran deal is working: Trump failed to certify the Iranian nuclear deal even though the International Atomic Energy Agency (IAEA) has repeatedly attested than Iran is in full compliance. The IAEA’s are the most extensive inspections ever conducted under any arms control agreement. Key NATO allies and even U.S. officials have concluded Iran is living up to the deal. Undermined nuclear diplomacy with North Korea: Trump repeatedly sabotaged the efforts of his secretaries of state and defense to negotiate with North Korea about their nuclear program. In fact, before becoming president, Trump encouraged other countries such as Japan and South Korea to develop their own nuclear weapons. Abandoning the agenda: Trump refused President Putin’s offer to extend the New Start Treaty, due to expire in 2021. He has not affirmed the goal of a world without nuclear weapons, embraced by every president since the United States signed the Nuclear Nonproliferation Treaty in 1968. “Let it be an arms race”: Trump has not only not slowed down the $1.5 trillion nuclear modernization program; in fact, he reportedly told military advisers that he wanted to increase the size of the U.S. nuclear arsenal to its Cold War peak of 30,000 warheads. He also signed a defense authorization bill that could violate the 1987 Intermediate-Range Nuclear Forces Treaty. While Trump promised to “drain the swamp,” he instead has taken every opportunity for self-enrichment, nepotism, and endless taxpayer-funded visits to his own properties, all while refusing the most basic measures of transparency. Trump’s glaring conflicts of interest have left many questioning whether the president is putting his companies first and worrying that the president’s goodwill can be bought with favors to his businesses. Quid pro quo: One day after Trump reversed his position on the “one-China” policy, the Trump Organization received long-sought trademarks from China. The Trump Organization’s first major real estate transaction after inauguration was selling a $15.8 million Trump Tower penthouse apartment to a Chinese-American executive directly linked to a front group for Chinese military intelligence. The Trump Hotel, a monument to conflicts of interest: Saudi Arabia spent $270,000 at the Trump International Hotel in Washington, D.C., as part of a lobbying effort to roll back legislation that allows family members of 9/11 attack victims to sue the Saudi government. This is but one example among many of Trump enriching himself and his family on the job, pocketing money from foreign governments and profiting at the American people’s expense by ignoring massive conflicts of interest. And then there’s Michael Flynn: Trump’s first national security adviser lasted just 24 days before being fired and then pleading guilty to lying to the FBI about repeated contacts with Russia. Flynn and his firm appear to have taken hundreds of thousands of dollars from foreign sources and tried to cover it up. Flynn reportedly helped delay a key military offensive against the Islamic State at a time when he was secretly on the payroll of the Turkish government, which opposed the move. By pitting Americans against one another, eroding their sense of shared truth, and squandering trillions on giveaways to the rich, Trump’s presidency is yielding a homefront that is less united, less solvent, and less ready to find common cause to meet transcendent challenges. More divided than ever: Trump has sought to gain political advantage by demonizing immigrants, Mexicans, African Americans, and others, publicly stoking hatreds that American leaders since segregation had agreed were simply beyond the pale. Trump’s hate is not only scaring away talent and investment. It is fostering is an inward-looking, embittered, and needlessly weakened America. Squandering America’s budget on giveaways to the rich: Budget-busting $1.5 trillion tax cuts heavily tilted to the top 1 percent will make it harder to fund America’s defense and diplomacy in the years ahead. They worsen the debt, undermine long-term solvency, and crowd out urgently needed investments to strengthen America at home—all to fund tax cuts for those who need them least. Trump has made it harder to unite Americans to do big things together: By refusing to be president for all Americans, Trump has made it harder to address the transcendent challenges of the future. In Trump’s divided America, citizens are too busy demonizing each other, disputing “alternative facts,” and reeling from the latest outrage to reach the country’s full potential. Survey the record and the results are clear: President Trump has needlessly alienated America’s allies; stoked tensions and heightened risks with little to show but damaged credibility; squandered the goodwill of people everywhere; and surrendered the high ground of America’s moral and global leadership. He has dishonored the ideals of the country and turned its people against one another. In just 12 months, Trump has done serious, lasting damage to America’s security at home and standing in the world. One year later, the country is divided and distracted by Trump from the challenges and opportunities of a fast-changing world and the American people are less safe.